If you're wanting to listen only to straight 12-bar blues, then please skip this review. As it is, I'm sure we here at Blues Bytes will get some complaints on why this CD, with its limited blues content, was selected as the month's Pick Hit. I really had to convince myself that it was OK to do so. But in the end, the power of this extremely interesting disc won out. 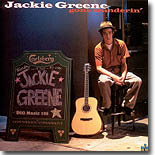 The first time you listen to Gone Wanderin' (Dig Music), you'll spend way too much time trying to categorize the music of 21-year-old Jackie Greene. Eventually, you'll stop trying to slap a label on him as you realize you're listening to one of the best CDs to come along all year. The Sacramento-based singer / songwriter / guitarist / harmonica player / pianist is a little Bob Dylan, some Tom Waits, a bit of Ralph Stanley, a dash of Robbie Robertson and a touch of Mississippi John Hurt. Now let's forget about whether this is blues or folk or country or whatever, and instead focus on this marvelous album. Gone Wanderin' opens with the title cut, a Dylan-esque rambling folk ballad, highlighted by Greene's excellent rack harmonica playing and effective nasally vocals. Bassist Hence Phillips contributes pleasant harmony vocals, while drummer Ben Lefever keeps the beat going with subtle drumming using brushes. Cut number two, "Tell Me Mama, Tell Me Right," evokes memories of a 1930s-era Delta string band with Tom Gunterman's wonderful scratchy fiddle and Greene's hot blues harp; the latter shows the range of his vocals to great effect here. "Travelin' Song," more of a folk number, features Greene in a solo setting, demonstrating extremely tasteful fingerpicking guitar. In addition, his vocals have more of an earthy quality on this tune. Greene picks up the electric guitar for "Mexican Girl" and tears off some Santana-style licks, but only after using the acoustic to turn out a very nice "south of the border" guitar solo. Like "Mexican Girl," "Down In The Valley Woe" is a little more out there than the other cuts, with its urgent rhythm and somewhat psychedelic violin and harmonica work. "Cry Yourself Dry" combines ol' timey country harmony vocals with Greene's gospel-tinged piano. "By the Side of the Road Dressed to Kill" is a Band-style song, showcasing Greene's incredible versatility as he tears off an awesome Garth Hudson-sounding organ solo. Is there anything this kid can't do??? OK blues fans, here's one for you ... Greene does a straight blues song, "Freeport Boulevard," on which he plays very good barrelhouse piano. Lloyd Billingsley contributes a tasteful baritone sax solo part way through this hot number. Then it's time to pick up still another instrument and play yet another style of music on "Judgement Day," as Greene uses the banjo for old-style bluegrass pickin' and grinnin'. He also blows good harp, while Phillips and Gunterman contribute dobro and fiddle work, respectively. Another number with more of a bluegrass sound is "Maria, Maria (It's a Sin to Tell a Lie)." "Gracie" is a quiet folk number telling the story of a young girl running from her small town; this one could have easily have come from the pen of Nanci Griffith, but instead is a Greene original like almost everything else on Gone Wanderin'. "The Ballad of Sleepy John" opens with a Neil Young-style harmonica solo, leading into another Band-sounding number; Greene again moves over to the organ for this song. Wrapping up the album is a live recording in which Greene steps out in front of fellow Sacramento band Mick Martin and The Blues Rockers. This live version of "Messin' With the Kid" is the only cover song among the 13 cuts here, and shows that Greene is also a very fine electric blues guitarist. Who is this Jackie Greene kid? And just how did he get so damn good at such a young age? Forget the fact that it's not strictly a blues CD ... Gone Wanderin' is just plain good old American music. All contents Copyright � 2002, Blue Night Productions. All rights reserved.